Discover our selection of paper filters for coffee makers, so you can continue to enjoy delicious coffees. 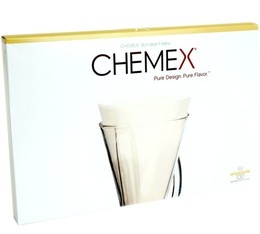 - a wide range of popular brands : Melitta, Chemex, Hario, etc. - category of filters : electric drip filter coffee machine, Chemex, V60, Aeropress etc. MaxiCoffee definitely has an extensive selection of paper filters so you can find the right one for your coffee maker! Packet of 100 VCF-01 paper cone filters for the V60 dripper VDC-01 by Hario. Packet of 100 VCF-02 paper cone filters for the V60 dripper VDC-02 by Hario. Packet of 100 VCF-03 paper cone filters for the V60 dripper VDC-01 by Hario. A pack of 100 cone filters especially designed for Phoenix drippers and pour over coffee makers made by Saint Anthony Industries. They have a 70° angle. Box of 80 NATURA Melitta filters in size 102 for electric coffee makers. Box of 80 Melitta Original size 102 coffee filters for electric coffee makers. Box of 80 Melitta Original size 1 x 4 coffee filters for electric coffee makers. Box of 40 Melitta Original size 1 x 6 coffee filters for electric coffee makers. Pack of 40 no. 4 coffee filters by Destination. 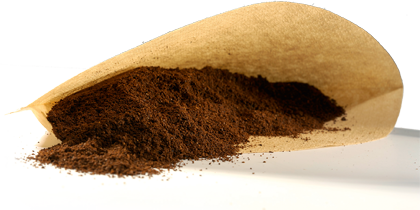 These brown coffee filters are chlorine-free and environmentally friendly. paper filters especially designed for the Moccamaster Cup One filter coffee maker. The paper filters are naturally bleached, without the use of any chemicals, preserving the coffee flavours. Pack of 45 brown paper wave filters for Fellow flat-bottomed Kalita-type dripper with a capacity of 2 cups. Pack of 45 brown paper wave filters for Fellow flat-bottomed Kalita-type dripper with a capacity of 4 cups. Pack of 100 paper filters for Espro Travel Mug for a cleaner cup of coffee or tea (less sediment and bitterness). Pack of 100 paper filters for Espro P3 and P5 French Press coffee makers (530 ml) for a cleaner cup of coffee or tea (less sediment and bitterness). 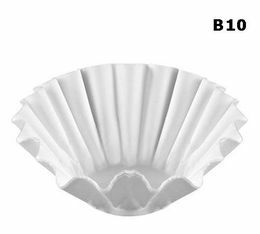 Pack of 100 paper filters for Espro P3 and P5 French Press coffee makers (950 ml) for a cleaner cup of coffee or tea (less sediment and bitterness).